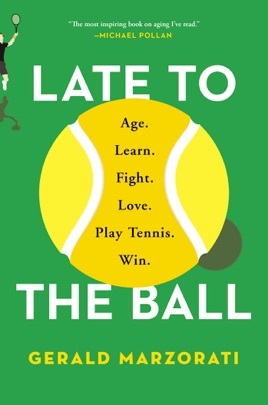 An award-winning author attempts to become a nationally competitive tennis player—at the age of sixty—in this “soulful meditation on aging, companionship, and the power of self-improvement” (The Wall Street Journal). Gerry Mazorati had the strong desire to lead an examined physical life, to push his body into the “encore” of middle age. In Late to the Ball Mazorati writes vividly about his difficulties, frustrations, and triumphs of becoming a seriously good tennis player. He takes on his quest with complete vigor and absolute determination to see it through, providing a rich, vicarious experience, involving the science of aging, his existential battle with time, and the beautiful, mysterious game of tennis. “Enjoyable…crisp and clean” (Publishers Weekly), Late to the Ball is also captivating evidence that the rest of the Baby Boomer generation, now between middle age and old age, can find their own quest and do the same. Marzorati, a New York Times Magazine editor and author (A Painter of Darkness) chronicles his six years trying to master the sport of tennis after picking it up in his mid-50s. Determined to be more than a recreational player, Marzorati not only works with the pro at his local club but also befriends a tennis-blogging Jungian psychotherapist, goes to tennis camp, visits a tennis academy to have his biomechanics analyzed, and enters tournaments to play the best U.S. players in his age group. Marzorati's prose is crisp and clean and his storytelling is focused. He also demonstrates an editor's knack for capturing the intricacies of other people's lives, such as his coach's immigration story or his playing partner's battle with sepsis (which ends with the partial amputation of his arm). Sometimes this pushes the author's own journey to the back burner, making him seem more of a spectator and less of a player. But observing, he finds, is a great way to educate oneself, and at its heart, this enjoyable work is a study of the physicality, psychology, and biology of learning.